Discussing 'Stranger Things', video games and RPGs with Jody Houser at SDCC 2018 – AiPT! 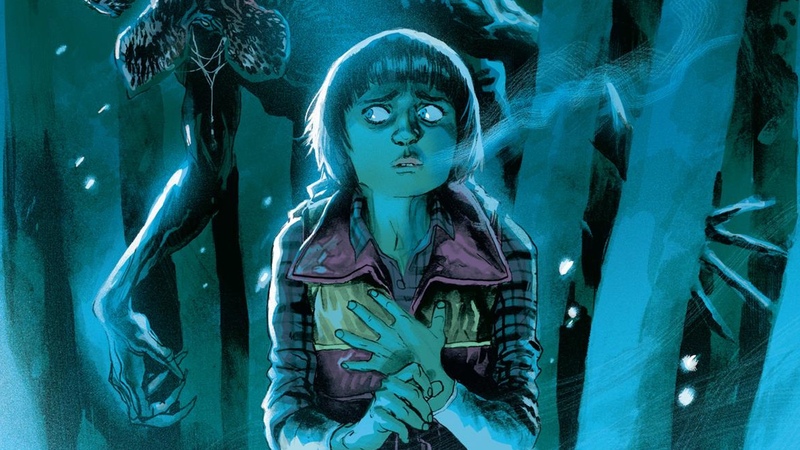 ‘Stranger Things’ gets a new comic and its writer Jody Houser discusses in depth! Just in time for Halloween, Dark Horse Comics is publishing the Stranger Things comic which can’t come soon enough. With word that the show’s new season isn’t coming until 2019, fans of the show will need their fix. To help aid in that is writer extraordinaire Jody Houser, who is writing and developing a series which will focus on Will’s journey in the Upside Down. I spoke to Houser at San Diego Comic-Con about the new series and how it coincides with the show, her delving into role-playing games, and more. AiPT! : How did the Stranger Things project get off the ground? Was it your idea? Jody Houser: No actually, my editor Spencer reached out to me and I worked with him on Halo here at Dark Horse. He sent me an email and said, “Do you have any interest in writing Stranger Things?” And as someone who dressed basically as Eleven for the past two Halloweens including shaving my head to do Eleven I was like “Oh yes I do like that show. That would be exciting.” They reached out to me. AiPT! : So I got to read the ashcan and it looks like you’re going in a different direction. It’s not a straight adaptation, is it? JH: Oh no. I mean we very specifically want it to be something that ties in with the first season but it’s still its own story. We are covering the events that Will went through in the Upside Down. It’s still the first season, but it’s from his perspective, and it’s getting see all the things that happened off-screen and how he survived in the Upside Down for so long and was the only one who did. You know just the fact that he’s this kid, and in the second season everyone’s very protective of him, but the fact that he survived for that long and got through what he did. He has to have this inner strength to him. Getting to see the decisions he made and what he did to stay alive, that’s a lot of fun to play with. AiPT! : Have you gotten in touch with the Netflix team at all? JH: I mean to an extent through Dark Horse, which is pretty typical for licensed books that everything goes through editorial. That way it’s good because there’s someone who’s coordinating the needs of both for the creative team and the licensor and it’s all coming to one central place. AiPT! : Are you given an outline that says like, you can’t you can’t have killer clones in the Upside Down? JH: [Laughs] I mean initially when I was first, you know, talking with Netflix, they pretty much had a couple of possible ideas for what the book could be and what it was Will’s perspective for the first season which is where we obviously where we went. They gave us a lot of room to experiment and play there. Even the style of the comic, because that was something I wanted to do — I wanted to it to feel like a TV show that was written in the early ’80s which is why we’re doing thought bubbles and narrative captions and sort of coming back to that style of comic writing. AiPT! : That’s really cool. Is it ever daunting taking properties like these, knowing the fandom behind them? JH: Yes. Which is why I try to focus on deadlines because deadlines are the scariest things of all. Any fear I get from fan reaction, or the number of people reading this…but the deadline is here and it’s real and it’s the scariest monster of all. It’s what I focus on. AiPT! : Did you do any research besides, obviously, watching the show? I mean is there anything you draw inspiration from, whether it’s a book or a movie? JH: Well actually this is one that’s sort of a touchstone for me; around this time, that wasn’t really referenced in the show, but the show has a lot of similarities to the novels of William Slater, and a lot of young adult sci-fi and fantasy, and horror books. One of the ones that really stood out to me was House of Stairs, which involved a lot of kids put through psychological experiments. He had a book where a little girl who played with her dolls and took her frustration out on her dollhouse got sucked into her dollhouse and the dolls torture her, but he had one book in particular called The Boy Reversed himself which dealt with going into other dimensions. The sad thing is that book came out I think in 1985, which was a little too late to actually reference that specific book in the comic. You know something that you use very close to the tone of the story and some of the same ideas and that’s sort of one of my big touchstones, that wasn’t necessarily in the original series but then also just like I mentioned before the ’80s comics and the style. Definitely went back and read some Claremont, because that’s specifically in the comic the kids reference in the first episode. AiPT! : Right right right. It’s interesting. Now there’s Dungeons & Dragons. AiPT! : Were you a D&D player? AiPT! : So you know that lifestyle? JH: I do, and I think RPGs and especially D&D, which a lot of people have become the most familiar with, that was the original but there’s also things like Critical Role, also published by Dark Horse, that is so plugged into the cultural zeitgeist right now and it’s such a great way to explore how characters interact with each other. Because games can get really stressful and high stakes. Seeing how friends argue or work together over it, it’s a great way to really dig into characters so that’s a lot of fun to play with. AiPT! : There are also adult graphic novels coming out as well? JH: No I’m not [doing them]. I know there are prose novels coming out [and] video games. Stranger Things is going to be everywhere. I think it’s especially fun that we’re doing this right now with a little bit of a longer break before next season. AiPT! : By the fourth issue will you be at the end of season 1? JH: Theoretically. I don’t know how much I can spoil for this, but, possibly. Stranger Things #1 hits comic book shelves September 26th.